Why is it Important to Protect Your Skin from the Sun? As the title of this blog post so blatantly suggests, within this entry we’re going to discuss why it’s so important to protect your skin from the sun. As you read these very words, skin cancer is the most common form of that disease across the entire globe. Still though, it doesn’t get the ink that it so richly deserves. But that’s why we, and others like us, are here; to do everything possible to get skin cancer and Melanoma awareness out there to as many people as we can. What’s the Big Deal About Protecting Your Skin? The big deal with sun skin damage is that we’re all exposed to it the very second we step outside every single day. And it doesn’t matter whether the day is overcast, cold, raining or snowing. 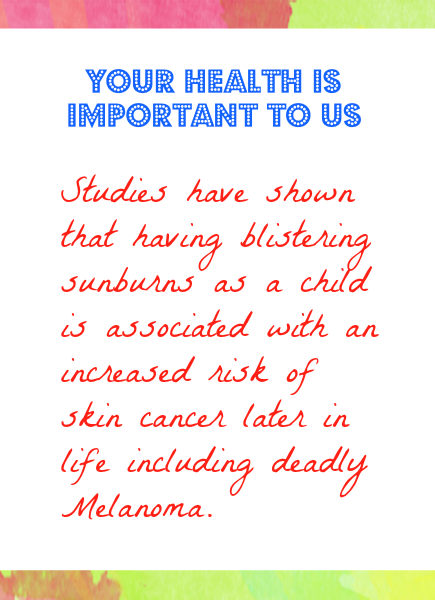 Exposure to the harmful UV rays generated by our sun is unavoidable. They penetrate the atmosphere to impact us during winter, spring, summer or fall. Its’ rays even reflect off of the snow and back onto us. The simple fact is that they’re inescapable. They can be blocked, however, and the techniques we use to do so are fairly simple. With even a little education on the subject, we can stave off the ill effects of the sun indefinitely. And our best defense against them right now is the daily use of sunscreen. Who Cares If I Get a Sunburn? We all should. Just because skin cancer doesn’t get the press that its cousins do does not mean it shouldn’t be taken every bit as seriously. Think about it; how often are you outside during a given week? How often do you drive? How much time do you spend at work or in your home next to windows? Are you starting to get the picture? Unless you’re protected, every time that the sun’s rays reach you they’re negatively impacting your skin; and its effects are almost always irreversible. UV rays can (and will) cause premature-aging, wrinkles, sun spots, skin cancer and even Melanoma. You may have heard that skin cancer and Melanoma are an easy fix. To be honest, that certainly can be true-if they’re caught early enough. However should you incur an unchecked Melanoma, the results can be devastating. Don’t take our word for it, though; look it up and see just what type of damage it can cause. If not stopped in its tracks, Melanoma is on par with the worst cancers a human being could ever experience. It can go well beyond the skin and completely destroy the internal organs of the afflicted. And that’s not hyperbole; it’s a fact. Many a wealthy celebrity has fallen victim to this useless scourge. What Can I Do to Avoid Skin Cancer? What can you do to protect yourself from the sun? Well, for starters we’ll reiterate what we’d mentioned earlier. Before you go outside, every day and without exception, apply a sunblock that is SPF 30 or greater. Also be sure to cover up as much as possible, regardless of season. That means long-sleeved shirts, long pants, UV-blocking sunglasses and wide-brimmed hats or ball caps and of course Sundicators UV sunscreen reminder wristbands. If possible, stay out of the sun during its peak hours of 10 a.m. and 4 p.m. And if you have to be outside be sure to seek either natural or artificial shade; such as trees or awnings. Also, make sure to re-apply your sunscreen every two hours at minimum. If you’ve been swimming or participating in sports or activities that have caused you to sweat, re-apply it even sooner than that. The sun is no joke, and under no circumstances should it ever be taken lightly. But as skin cancer awareness spreads, more and more we’ll be able to sidestep it and its awful effects.